Each todo is tagged #todo and has a body, which is the text of the todo entered by the user. Additionally, each todo has two flags. The first flag, completed, affects how the todo is displayed, and allows the user to filter todos based on completed status; we can look at “completed” todos, “active” todos, or “all” todos. The second flag, editing, toggles an editing mode on the todo. This is used later to allow the user to update the body text of the todo. These todos exist in the context of an @app, which we use to hold global state information. We use it to place a filter on the todos. The filter can be one of “completed”, “active”, or “all”. Header - Contains the @toggle-all button as well as @new-todo, which is an input box for entering new todos. Body - Contains @todo-list, the list of todos. The work here is handled in the second block. Footer - Contains the count of todos, as well as control buttons for filtering, and clearing completed todos. In this block, we do a little work to determine todo-count, all-checked, and none-checked. Other than that, this block simply lays out the major control elements of TodoMVC. A key aspect of this block is the bind keyword. This denotes the beginning of the action phase of the block, and tells Eve that to update records as data changes. This is the key component that enables Eve to react to user interaction and update the display. 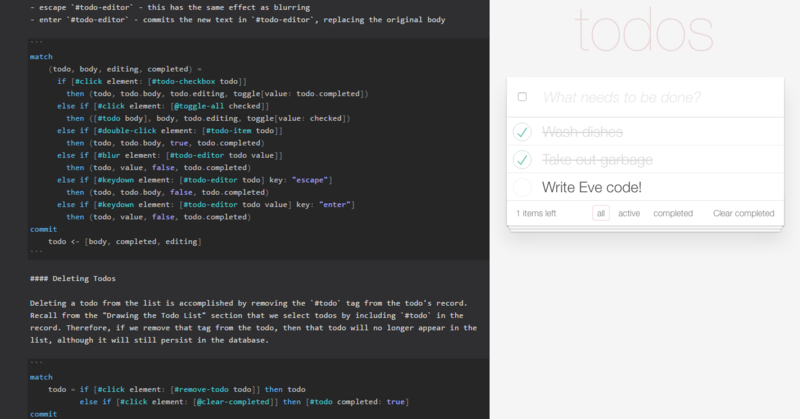 Thanks to Eve’s set semantics, we don’t need any loops here; for every unique #todo in the database, Eve will do the work of adding another #li as a child of @todo-list. A user can interact with TodoMVC in several ways. First and foremost, the user can create new todos. When the @new-todo input box is focused and the user presses enter, the value of the input is captured and a new todo is created. Of note here is the record [#todo body: value, editing: false, completed: false, kd]. The inclusion of the kd attribute might seem strange, but its purpose is to guarantee the uniqueness of the todo. Let’s say we want to add two todos with the same body. If kd were not an attribute, then the two todos would be exactly the same and Eve’s set semantics would collapse them into a single todo. Therefore, we need some way to distinguish todos with identical bodies. Adding kd allows for this. Here we handle all the ways we edit a todo. Editing includes changing the body as well as toggling the status of between complete and active. click #todo-checkbox - toggles the completed status of the checkbox. click @toggle-all - marks all todos as complete or incomplete, depending on the initial value. If all todos are marked incomplete, clicking @toggle-all will mark them complete. If only some are marked complete, then clicking @toggle-all will mark the rest complete. If all todos are marked as complete, then clicking @toggle-all will mark them all as incomplete. Deleting a todo from the list is accomplished by removing the #todo tag from the todo’s record. Recall from the “Drawing the Todo List” section that we select todos by including #todo in the record. Therefore, if we remove that tag from the todo, then that todo will no longer appear in the list, although it will still persist in the database. We can extract this value using #url, which has a hash-segment attribute that automatically parses the URL for us, returning the value (expected to be any one of the above). Any other value will fail to show any todos, but the application will not break.